The time that the players and coaches have been striving for all season has arrived: the playoffs. In this “second season,” anything is possible and everything is on the line from week to week. Winners advance. Losers go home. The Eagles have quite the unique opportunity this Friday as they take on the Oak Ridge Wildcats on the road. 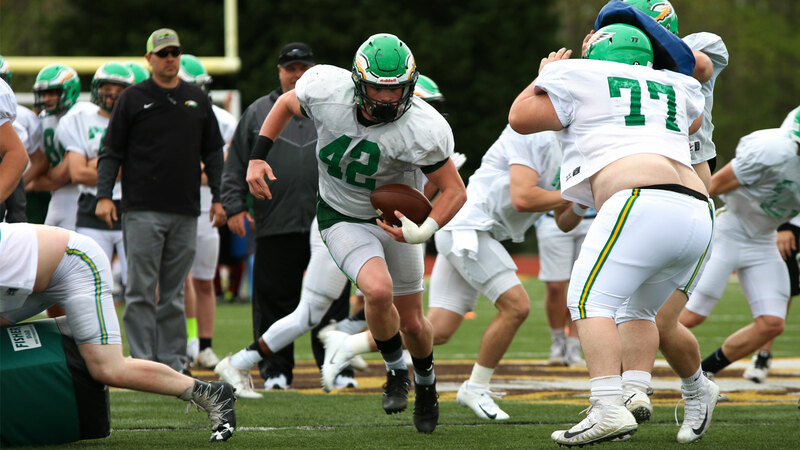 The two teams have met before, clashing in the quarterfinal round of the 2014 playoffs that saw Rhea County escape victorious by a score of 35-21 and advance to the semifinals at home where they fell to Knoxville West in a heart-stopper. The Wildcats are led on offense by running back Jordan Graham (#8, Sr.), wide receiver Jeremy Mitchell (#1, Sr.), and quarterback Herbert Booker (#13, Sr.). Also be on the lookout for sophomore quarterback Mitchell Gibbons (#14) who has shown promise in limited action. The main offensive style, when Booker is at quarterback, is focused on the option attack from the shotgun that utilizes his running abilities and the explosiveness of Graham and others. When Gibbons is leading the offense, the style moves more towards a pass-oriented attack to capitalize on Gibbons’s passing capabilities. Both are more than capable of moving the ball on offense, and do not be surprised if we see both see action on Friday. Booker is also a standout on defense as well, playing at corner for the Wildcats. Jack Replogle (#26) also assists in the secondary for the ‘Cats. Junior running back and linebacker Tyrell Romano (#21) is also a contributor whose name will be heard quite often on Friday night. The Wildcats play in one of the toughest regions in all of 5A: Region 3. Included in their region are West, Campbell County, Fulton, Powell, Karns, and Clinton. To finish second in that region is quite the achievement, and they only lost by eight points to region champion, and the state’s top-ranked team in 5A, Fulton in the defacto region title game last week. Including the meeting on Friday night, the Eagles and Wildcats have met a total of nine times, the last coming in that thriller in 2014 at Oak Ridge which was actually the Eagles’ first and only win in the series. The winner of the matchup will square off with the winner of Soddy-Daisy and Clinton in the second round, and, depending upon who wins in that game, a potential home game is on the line. I think this game is one the Eagles can, and should, win. After the stellar performance the offense and defense displayed against Cane Ridge last week, I foresee the Eagles advancing to play another day. Here are some of my 5A playoff predictions. My picks are listed in italics.